Steve Mnuchin and his then-fiancee Louise Linton are seen in the White House before his swearing in as U.S. treasury secretary, Feb. 13, 2017. A bomb squad investigating a suspicious gift-wrapped Christmas package from “the American people” that was left outside the home of Treasury Secretary Steven Mnuchin found that it was horse manure. 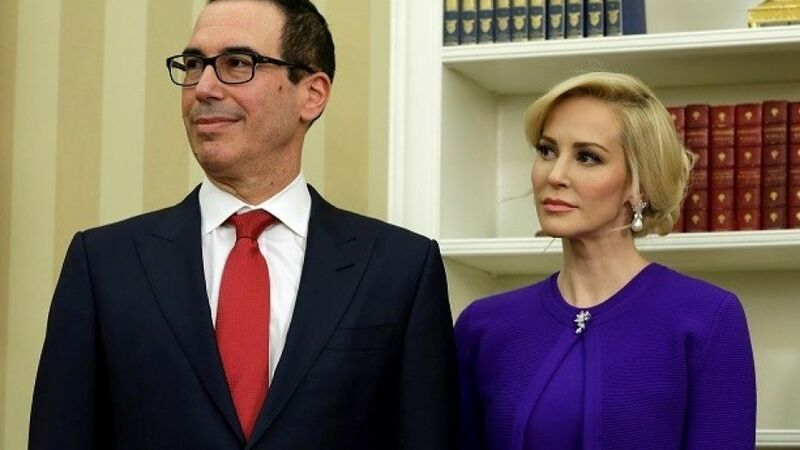 A Los Angeles Police Department bomb squad responded Saturday after a neighbor in the city’s Bel Air section reported seeing the package in the driveway of Mnuchin’s residence, KTLA-TV reported. But it turned out that the package, wrapped in Christmas paper and addressed from “the American people,” was filled with horse manure, LAPD Sgt. R. Briggs said. Officials determined that it was not a threat. A Christmas card discovered inside made negative references to Mnuchin, President Donald Trump and the $1.5 trillion tax bill that Trump signed into law Friday, police said. The package was removed from the scene a short time later. Reports suggest that no one was evacuated from the area. Police haven’t released additional information about the package. It wasn’t clear whether Mnuchin or his wife, Louise Linton, were inside the home at the time. Mnuchin became the 77th secretary of the U.S. Treasury in February, when the U.S. Senate confirmed his appointment by President Trump.